Wilfred Smith was born in Parson Drove, Cambridgeshire in Q4 18822, the eldest child of Tom (b. c1866 Parson Drove, Cambs) and Eliza Ann Smith (b. 1870, Parson Drove, Cambs, née Adlett ). Tom worked as a farm labourer in the rural areas around Peterborough all his life. He and his wife lived first at Parson Drove, where their first four children were born, before moving to Crowland, Lincolnshire, by about 1898 and where living there, at Old Top Bar, West Bank, with five children in 19013. where the remainder of their at least 10 children were born. 1n 1911, Tom & Eliza were living with their younger children at Gilberts Bar, Welland Bank, Newborough4. By then, Wilfred was apprenticed to Frank Ingham, a local butcher, and was living in their household at North Street, Crowland5. At some point in the next few years, Wilfred moved to Beeston, apparently to take up a position working for Herbert Johnson Ward who traded as a butcher at 62 High Road, Beeston, on the corner of Union Street6. At some point, he met Hilda Kirk who was born in Radford and had lived there with her parents, working as a pattern girl in the lace trade. She appears to have moved to Beeston following her father's death in 19147. The couple became close and probably thinking about marriage when all was put on hold, at least for the time being, when Wilfred enlisted in the Army, with the Sherwood Foresters, probably early in 19158. There were probably still opportunities for them to meet while his months of training continued but, eventually, the almost inevitability that Wilfred would be sent to France had to be faced. On 8 July 1916, Wilfred and Hilda married at Beeston Parish Church9. With the Battle of the Somme now underway, it was probably only days before he had to leave his bride to join the battle. Private Smith was attached to 9th Battalion which had been withdrawn from Gallipoli to Egypt earlier that year and, in June 1916, as part of 11th Division, had been ordered to France to reinforce Third Army on The Somme. The battalion, then consisting of 20 officers and 526 men, had arrived at Marseilles on the 3rd of July and moved to the Somme. By the 22nd of July, reinforcements - which would probably have included Private Smith - had arrived and the battalion's strength had grown to 28 officers and 736 men. After arriving at Arras on the 28th July, they moved into the trenches and, during a generally quite period, underwent training before relieving the 13th Cheshire Regiment in trenches at Ovillers on the 6th September. There they faced very active artillery which became the pattern for the rest of September. On the 26th the battalion took an active part in the Battle of Thiepval Ridge, a major operation on a wide front, involving British and Canadian units, designed to clear the Ridge in preparation of a attempt to pinch out the German salient. On the first day the battalion fought bravely and effectively, largely achieving their objectives but very heavy casualties meant that it became increasingly difficult to hold on to the gains. In September as a whole, the battalion suffered 20 officer and 473 other rank casualties - including those killed, wounded and missing. Reinforcements of 8 officers and 141 men were taken onto strength. With so many arrivals, most of which were unfamiliar with active trench warfare, much of October and the early part of November was spent training. On 21st November the battalion entered trenches at St Pierre-Divion in the follow-up to the Battle of Ancre which had seen a rout of the enemy but with heavy casualties on both sides. Over the next week, the battalion moved throughout the area, facing very wet and muddy conditions, reestablishing trench positions while facing enemy action. On 29th the battalion was due to be relieved by the Yorks and Lancs but, confusion amongst the guides and the relief going astray led to eight casualties10. One of these was Private Smith who was badly wounded and removed to either 49th or 9th Casualty Clearing Station, both of which were based in Contay, a village on the main Amiens to Arras road. Sadly, he died of his wounds on the 4th December and was buried in the Contay British Cemetery, a short distance outside the village centre. The site was used for burials from the 49th and 9th Casualty Clearing Stations, which had arrived in Contay at the end of August and during September respectively. 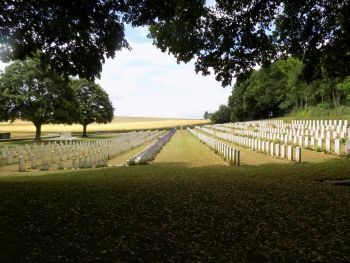 The cemetery now contains 1,133 First World War burials. Private Smith was posthumously awarded the British War Medal and the Victory Medal11. His wife Hilda, as his sole legatee under the terms of his Soldier's Will, received payment of his financial effects of £2 9s 2d on 6 February 1917 - with the small additional amount of 2/9d a month later - and his War Gratuity of £3 on 10 November 191912. In 1922, Hilda married Harold Holroyd and moved to the Huddersfield area - from where Harold originated - where their two sons were born. Later they moved to the Merton district in south-west London where they lived out their lives with Harold working as a master builder. Hilda died in 197513. 3Crowland, Lincolnshire, 1901 Census, Piece 1468 Folio 140. 4Crowland, Lincolnshire, 1911 Census, Piece 8715 RD170 SD3 ED12 Schedule 67. The associated enumerator's schedule describes this address as 'West Bank, Crowland'. 5Crowland, Lincolnshire, 1911 Census, Piece 8718 RD170 SD3 ED12 Schedule 3. 6This association is based on Wilfred's declared residence - '62 High Road' - on his marriage record. This address in Beeston was occupied by the Ward family and operated as a butcher's shop, from about 1911. It appears that Wilfred was employed by Ward after he completed his apprenticeship as a butcher. 8As Wilfred's Service Record has not survived, this approximate date has been estimated, based on the amount of his War Gratuity - which indicates that he had served less that 12 months at the date of his death. He is likely to have received a minimum of 3 months training, perhaps longer, before his arrival in France in about July 1916. 9Their marriage certificate records Wilfred as "Wilfred Adlett Smith, 23, Bachelor, soldier, of 62 High Road, son of Tom Smith, farmer". Hilda is recorded as "Hilda Kirk. 22, Spinster, of 32 Harcourt Street, daughter of John Kirk (deceased), lace maker". Banns had been published. The witnesses were Bess(?) Kirk (possibly Betsy, Hilda's mother) and Arthur Beardsley. 10This account of the battalion's involvement in the Somme is based on the Battalion's war diary. 11Details from Wilfred's Medal Card - available on ancestry.com. His embarkation date is not recorded on the card. 12Details of the payments are from the "Army Register of Soldiers' Effects, 1901-1929" - available on ancestry.com. Hilda is known to have lived at 48 Chilwell Road, Beeston around this time as this address is given in Wilfred's Commonwealth War Graves Commission entry. 13Their marriage is recorded in Q2/1922 in Basford Registration District (Ref 7b 687). It is not clear how they met. Harold Holroyd, born 29 March 1892, was the son of Eli Holroyd, a stone mason and builder and his wife Jane who were living in Slaithwaite, near Huddersfield by 1911. At the time of the 1939 Registration, they were living, with their two sons, at 100 Beverley Way, Merton with Harold described as a Master Builder. Hilda's death was recorded in Merton Registration District in Q4/1975 (Ref 14 1893). Harold's died on 9 October 1982 by which time he had moved to 40 Westway, London SW20 (Probate Calendar).